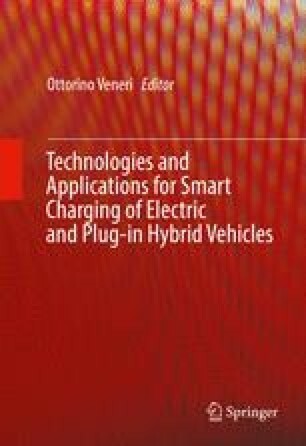 This chapter provides an overview of the different charging architectures available for electric vehicles and plug-in hybrid electric vehicles. The charging architectures are addressed following two main categories: onboard chargers, used mainly for slow and semi-fast charging (generally AC connection), and off-board chargers, used for fast charging (DC connection). The chapter focuses on the mainstream solutions available in the industry, and also presents some recent advances and trends found in the literature. In addition, the chapter provides an introduction to well-established charging standards being used by manufacturers. Finally, the control schemes used in charging configurations, including the control schemes for DC–DC and AC–DC converter stages, are discussed, the latter considering both single- and three-phase control schemes.